Make sure you become a follower to my blog and like myfacebook page, and follow me on pinterest for the latest and greatest! My favorite pie is cherry pie. I just love me some cherry pie. I have never liked pumpkin pie, so cherry pie is my top choice for Thanksgiving. 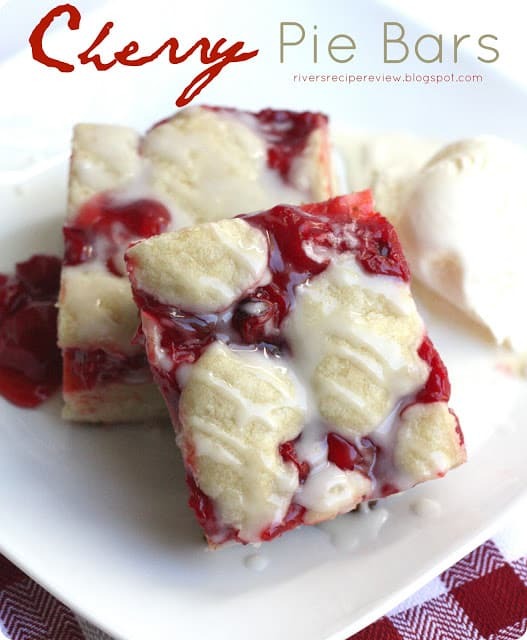 These cherry pie bars are the bomb! It was just like biting into a cherry pie and served warm with a side of vanilla ice cream…. wow. I think I want some more now! Things that I would do differently next time: It suggests baking them in a 15x10x1 pan or a 9×13. Next time I am going to bake them in a 15×10 pan so they aren’t so thick and don’t take so long to bake. Grease a 15x10x1 pan or 9x13, whichever one you decide to use. Spread 3 cups batter in a 15x10x1 (Also works with 9x13- baking time will at least be 35 minutes) Spread with pie filling. Drop remaining batter on top of pie filling. These bars must have like 1000 calories each! They look good, but wow! Could probably use less sugar since cherry pie filling is already sweet. Then I might put the topping pretty thing. but do you know how many calories these have? For any nutritional questions I like to use myfitnesspal.com or skinnytaste.com to answer any information I am looking for. Hope that helps! I ommitted the almond extract. And used apple pie filling instead.. added cinnamon ? How is a toothpick going to come out clean when you have cherry pie filling in it ? I made these and they were delicious. Taking them to a family reunion this weekend. I made this for the 4th of July. Added extra almond and cherry juice in the glaze. Turned out amazing! Thank you for all of your delicious recipes! I have made these several times but I used fresh cherries. They are delicious. I have some fresh apricots and I plan on making some using the apricots. I’m sure they will be just as tasty as the cherry bars are. Can I use any pie filling or fresh fruit instead of cherry? I have made this recipe for years. I also change the flavor of pie filling for different times of the years or occasions. They are a family favorite(raised 5 kids on them). A doctor friend once called them “Puggie Pills”. Love them. Think Lemon is my next favorite, then Blueberry. These pie bars look so delicious and so easy to make! Perfect snack! can you tell me the nutritional info on these bars, calories, sugar %, etc……? I like to use skinnytaste.com or myfitnesspal.com for any nutritional questions. This is an old recipe my memere called fruit squares. The favorite was always cherry or blueberry. No glaze needed though, as the come out of oven, rub butter on top the sprinkle with powdered sugar. Also more almond extract like a full teaspoon and add another egg! Will make a much better recipe. Could you just use a white cake mix? Great recipe. How do you make the glaze or do you have to buy it? My attempt did not bake in the middle. I baked it longer than suggested. It looks great, but the middle did not bake. Could be that I used a glass pan. Looking for the 15 by 10 metal pan and will try again. The flavor is awesome around the edges, but the raw batter is way too sweet. These tinned fruit pie fillings are vastly improved with the addition of lemon juice, lemon rind and salt as these tend to be rather bland. I also put lemon rind in the batter as well as vanilla essence. I’ll probably put lemon juice in the glaze or perhaps not. This is the second time I’ve made this recipe which was a big hit at the clinic where I practice. I haven’t made this type of bar in a while. Would it be possible to cut down on the pound of butter? Or would that not work? The butter is kind of like glue and sticks it all together without it crumbling. You are welcome to lower it and see how it tastes. The presentation just may not be as great! Let me know what you think! This looks delicious and easy. Also, like the way the recipe is laid out and you can print it. I made these last Christmas and plan to again this year.. I did cut the batter ingredients in half and I drizzled them with melted white chocolate Instead of the glaze. So yummy!